Here, as promised, is a highlight reel of my work on "Cars" and the DVD short, "Mater and the Ghost" Light, as well as a couple shots I did for the commercial I directed for State Farm. It's an 18 mb Quicktime movie, and you'll need Quicktime 7 to view it. Oh wow Victor! Thanks so much for posting that! Those were some major major scenes!!! You did such an excellent job! You animated by far the best part of Mater and the Ghost Light where he's rattling and so on. Oh, and the "he did what in his cup" and "oh a little bit, but I'll be alright" or "I'm starting to think he knowed you was going to crash!" lol those are some of my favorite parts of the whole movie! The more serious scenes were also excellent! Great job and thanks again! Sweet. I thought your stuff with Mater reversing was fabulous - definitely the best character in the film for me. Also, that last shot of Mater shaking uncontrollably is pretty fantastic, and looked fun to do. Awesome stuff Navone! My favorite shot is when Mater shoots himself in the face when trying to do the "Ka-chow" thing. I love when he shakes his head in recovery! BRILLIANT WORK! Sweet pieces as always. Thanks for showing! I'm gonna break the trend, but my favorite piece is the green minivan (Van?) saying "I have the GPS, never need a map." Just great beats. Thanks for sharing. Hey Victor, really great scenes! Wonderfull acting, expressions and emotions representation! Your work is a daily inspiration to me!! Fantastic work Victor. Too.. many.. fun.. shots..
Lots of great work Victor! 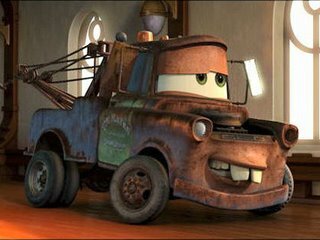 Always loved how McQueen looked when Mater was towing him back up after his fall. I remember noting that in the theatre. Excellent poses all around. if you want to contact me please write to agustinayague406@hotmail.com or my argentinian blogger http://fotolog.terra.com.ar/agus_yague1..
Amazing Work! The scenes you did in the short were some of my favorite. Pixar is very lucky to have you working for them. Second, thanks for sharing this, your work is amazing. Honestly a lot of these scenes are amongst my favorits! It's impressive how you master both crazy action and subtle details. Sweet work Victor! You are one of my favorite animators. So much character in the cars, i can't imagine how hard that was to do. How did you think in terms of line of action?